It all started with the avocado tree in our backyard. This is an old, temperamental tree. We've lived here 13 years, and I still can't figure out what makes it tick and what ticks it off. Most years it flowers, then drops most of its blossoms before setting fruit. In those years we get maybe seven or eight avocados total, and more often than not the squirrels knock them down and pock-mark the outsides before we can bring them inside to ripen. Avocados, I have discovered, will not ripen on the tree - this may not be true in the world at large, but it's true in our yard. But there have been a few magical years like this one. In a magical year, the tree is happy and generous, and in those years we get three or four dozen round, plump avocados. They hang on the tree until I borrow the long-handled picker from our neighbors. Or, this year, until eight-year-old Weston has a playdate with a new friend who casually scales the sides of buildings (I'm not kidding; my husband witnessed it). The avocado tree posed no challenge for him, though Weston had never found the route. Up the tree went the friend, up behind him went Weston, and down came two dozen avocados in one afternoon. Harvest time. Here's the problem with picking two dozen avocados at the same time. Five days later, you're stuck with one big bowl of guacamole. So we've been eating avocados, and avocados, and avocados. Weston prefers to mash them himself on his plate with lemon and salt, then dip everything from chips to daikon radish slices to steamed snap peas. But Emery, the other morning, was thinking about the "California omelette" he sometimes orders at Norm's (the closest thing we have to an East coast diner). Thus was born the Spring Scramble. It's simple, really: Eggs scrambled with green onions, chopped bacon and cheese, topped generously with slices of fresh avocado. Emery put salsa on his, although not until after the picture above was taken. The avocado cools the heat of the eggs and the salsa and gives every bite a creamy background. And veggies for breakfast, too. There's nothing better. Heat a nonstick pan over medium heat. Melt the butter, then add the green onions. Pour over the beaten eggs, then sprinkle on the bacon and cheese. Scramble gently until the eggs are cooked to your liking. Remember that the cheese will be runny after the eggs are done, so it may look wet for longer than you expect. 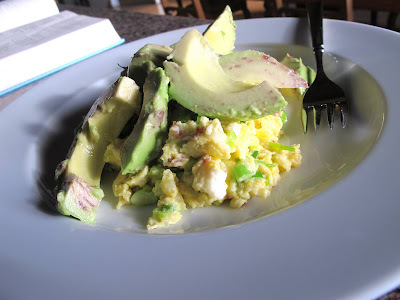 Put the eggs on a plate, top with the avocado and salsa if you're using it, and dig in. Makes breakfast for one hungry 11-year-old boy.